Replacement nebulizers, parts and filters for compressors commonly used in home nebulizer and breathing treatments from manufacturers such as Caire, DeVilbiss, Healthdyne, Medical Industries/EVO, Medquip, Philips Respironics, Precision Medical and more. 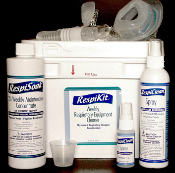 Replacement filters for Aerosol or Nebulizer compressors. Filters need to be changed approximately every 2 months with normal use or when they appear dirty. 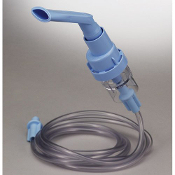 Replacement reusable medication nebulizer for use with nebulizer machines/compressors. Drive Medical Nebulizer Compressor with nebulizer kit and filters. Oxygen Flow Meter - Pen Style, 0-8LPM. Check your neb, O2, machine or device at home. RespiClean 8 oz. Daily Spray Bottle. RespiClean Towels with 1 oz bottle of RespiClean Daily Spray. RespiClean Travel Size Daily Spray Bottle, 1 oz. RespiSoak Concentrate Weekly Cleaner, 32 oz.